Meeting Jef Cornelis at his Liverpool Biennial archive exhibition is a rather bizarre experience. Shaking hands with the Belgian artist, filmmaker and TV director for the first time at the show’s venue, St Andrews Gardens student accommodation (known by locals as The Bullring), we consider together Cornelis’ body of work from a 50 year career. Taking in his colossal oeuvre, he shouted “Jesus!” frequently — fairly shocked at the breadth and quantity of work produced during his lifetime, displayed altogether in this manner. He could not, unsurprisingly, remember all of his programmes; there are, after all, over 200 in this official collection. ARGOS Media and Arts Centre have ownership and have recently translated the recordings into English. As forthright in person as on screen, Jef describes the display of his films — on multiple TV sets in the accommodation office – as “not perfect, but at least we get to see them here, in Liverpool”. Relatively unknown in the UK, Cornelis is an established creative in his own right; he was an executor, director and scriptwriter for the VRT, the Dutch-language Belgian public broadcasting corporation, from 1963 until 1998. As a Biennial artist, he adds an essential ingredient — as a provocateur, a cultural critic and a negotiator of the arts. As a radical TV director, the visual arts became a regular subject for him. He encouraged a discussion on the way the arts can sometimes break with tradition and reveal something about culture and, inevitably, us. He filmed artists and critics showing displeasure in the way the art market has remained stagnant. Taking particular issue with Documenta in Kassel, Cornelis decided to take a TV crew to cover the fourth edition in 1968, the last festival to be directed by its founder Arnold Bode. Having also filmed the Venice Biennale, he remarked that the art world is “remote, critical, ambiguous”. He returned to the visual arts ten years later, taking a fresh look at its development, as the idea of ‘art for everyone’ took hold. Anyone who has viewed the Cornelis archive in this year Liverpool Biennial will be accustomed to a sometimes surprising and outrageous filmmaking style. For example, there are no genre-specific time scales. Art exhibitions were all subsequently filmed in the same provocative way, revealing and adopting an exploratory approach to the art world, embedding a vigorous intellectual discourse and, on occasion, incorporating disjointed images, pictorial worlds and discordant sound. Asking Cornelis about his approach to filming, he commented that it is “always conflicting… All my films were intentionally propagandist”. He also interviewed artists outside the studio space, as he felt it was “important for short items. I wanted to get them aired during prime-time TV. I asked Daniel Buren several times why he chose not to exhibit in the museum or the gallery but externally. He’s a very clever artist; we used him to conclude the programme on Sonsbeek Sculpture Park, a controversial project which created a lot of tension for some artists and the public”. “These instances were unusual for me and in this case… I had no authority over the filming schedule and the content, apart from in the cutting room, and even then we could not broadcast because of Finlay’s right to the final edit. “Often these conflicts were kept in the finished production: I kept these tensions and added a soundtrack that reinforced the danger we felt, as a crew”. 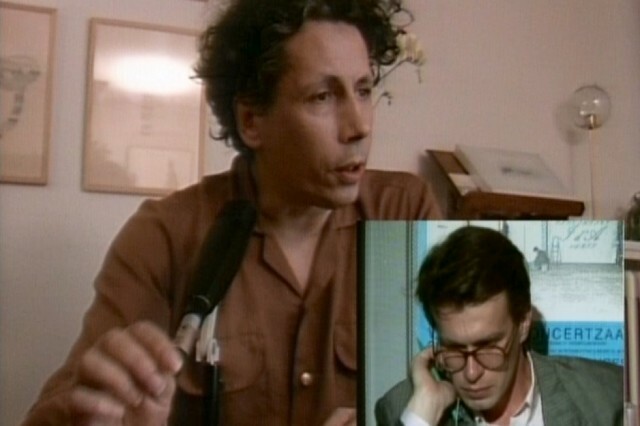 Cornelis remembers fondly the films he made on location, such as at the historical site Castello Di Rivoli near Turin in 1984, when his career had settled and production budgets allowed him to travel. Focusing on an art exhibition in the first Italian contemporary arts museum — an 18th century castle with its original interiors lovingly restored, showcasing 70 artists – Cornelis places the historic building right in the centre of the film, deploying a roaming camera moving at a snails pace, gliding through the architecture whilst shaping imaginary mini-narratives. “The director’s role”, Cornelis muses, “is to harness the work in progress: it’s necessary as part of the creative process”. “Multi-channel TV for Cornelis “seems insignificant. Who watches TV now anyway?”"
He was also not afraid to expose the living conditions of the poor and immigrant settlers in ghettoised areas. Furious that these conditions were, as he saw it, a result of a “power elite blindly experimenting with city development and urbanisation”, he made a trilogy of films on architecture and urbanization in the 1970s through to the early ’90s. They’re still relevant now. A Liverpool comparison would be Terence Davies’ Of Time and the City, and I personally don’t think it holds up to the edginess of the Cornelius approach: whilst both are whimsical and poetic essays on a city lost. Cornelis’ films Brussels, Shards of Happiness, and The Street, both deploy breathtaking aerial shots and high-action opening scenes, exposing the hypocrisy of high modernism. They are films he is very much proud of. Cornelis’ Biennial exhibition at St Andrews provides a perfect place to view his work; now occupied by Liverpool’s students rather than working-class families, it was once a utopian social housing project, and is testament to the way in which the city evolves. Older visitors may see in Cornelis’ oeuvre references to British arts and culture broadcasting, throughout the golden years of the 1960s and ’70s; others may struggle with Cornelis’ use of long takes and lapses of continuity in the live programming series. Cornelis tells me that Icebreaker, 1983, was groundbreaking: “We were the first to go out ‘live’ filming in three locations; viewers were given alternating shots. It was a discussion show for the newly formed Arts Affairs department”. Current forms of television, especially multi-channel TV, according to Cornelis “seems insignificant. Who watches TV now anyway?” He passionately argues that: “we need platforms for different types of dialogue and debate. Contemporary TV is mainly rubbish, anyway. “You can’t force ideas about art into a public space; the aim is to raise awareness of its potential, for the present audience to see arts and culture in different places, through the TV medium … [yet] it’s hard now to be commissioned for work unless it has a commercial edge”. Rather than explicitly exposing the imbalance of power in his subject matter, the best aspect of how Jef Cornelis works is, for me, how he implicitly delivers intellectual commentary through experimentation, allowing subjects to expose their own motives, naturally. Working within Flemish broadcasting he was aware of those who had an agenda: “I stayed clear of them and of the drinking culture that was present in TV broadcasting at the start of my career, now I don’t care — I just want others to enjoy them”. Lets hope ARGOS complies with his wishes.